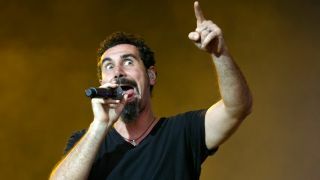 System Of A Down, Biffy Clyro and Aerosmith have been confirmed as the headliners for next year’s Download Festival. A further 11 acts have also been confirmed for the 2017 event at Donington in Leicestershire – including Rob Zombie, Prophets Of Rage, AFI, Slayer and Of Mice & Men. The full list can be viewed below. Download 2017 takes place from June 9 to 11. Their Friday night slot will be System Of A Down’s third headline appearance at Download. The band say: “It’ll have been a couple of years since our memorable Wake Up The Souls show at Wembley, so returning to the UK to headline Download, a festival we always love to play, is really exciting for us. Biffy Clyro’s Saturday night main stage appearance will mark their debut as Download headliners. The released their latest album Ellipsis this year. On Sunday night the curtain will be brought down on the event with a headline appearance by Aerosmith, who will be making their only UK appearance of 2017. Guitarist Joe Perry says: “Every time we go on tour I look at the schedule for cities, towns or events that I look forward to playing. Of course, the Download Festival 2017 rumour mill has been going into overdrive with Guns N’ Roses and Metallica previously being touted as potential headliners. TeamRock also revealed this week who we want to headline Download Festival 2017. Have Blink 182 just confirmed themselves for Download 2017? Festival boss Andy Copping says fans can look forward to a “world class” weekend. He says: “We’re incredibly excited to announce the Download 2017 headliners. We have three giants of rock and metal topping the bill. As always, Download fans can expect world class performances across the weekend. You won’t want to miss a thing. “System Of A Down made headline history back in 2011 and 2017 will no doubt see them bigger and better than ever. Saturday’s headliner, Biffy Clyro, have raised the bar for rock music – we’re always looking for bands to make their Download headline debut, and I have no doubt they’ll be worthy of the title. Update: Download Festival have made another 2017 lineup announcement featuring Alter Bridge and many more bands.